West Windsor, NJ – The Princeton National Rowing Association’s Mercer Rowing Club sent three boats to compete at the 2016 USRowing Youth National Championships held on Mercer Lake, June 10-11 and all three finished among the top twelve crews in the nation. In the largest ever Youth National Championship regatta ever held, more than 1700 athletes representing 178 clubs and high school rowing programs from 30 states raced 411 boats down the course on Mercer Lake to compete for national titles in eighteen events. The PNRA/Mercer varsity girls 8 plus coxswain boat finished fourth in the nation and featured senior captain Kate Hickey (Notre Dame High School), sophomore Sara Hansen (West Windsor Plainsboro High School South), senior Caitlin Cleary (Princeton High School), junior Laila Shehab (Hopewell Valley High), junior Katie Lustig (Council Rock North), sophomore Bridget Parker (Princeton High School), senior Rachel Mumau (Millstone Township), sophomore Mia Barkenbush (West Windsor Plainsboro High School South)and senior coxswain Colleen Gillis (Freehold Township High School). The girls are coached by Steve Baranoski in his first year with PNRA/Mercer. The PNRA/Mercer lightweight girls 4 plus coxswain boat finished eighth and featured senior Elise Gorberg (West Windsor Plainsboro High School North), junior Celia Varga (Princeton Day School), senior Eileen Hu (West Windsor Plainsboro High School South), junior Sheila Kennedy-Moore (Princeton High School), and senior coxswain Sydney Holgado (Robbinsville High School). The PNRA/Mercer boys varsity 8 plus coxswain boat finished eleventh in the nation and included junior Andrew Hickey (Notre Dame High School), senior Jason Fleurial (Princeton High School), senior co-captain John Tanguay (Hopewell Valley High School), junior Carter Levine (Princeton High School), junior Grant Barthelmes (Ranney School), junior Daniel Stoddard (West Windsor Plainsboro High School South), freshman Jack Gallagher (Council Rock High School North), senior co-captain Kevin Borup (South Brunswick High School) and junior coxswain Sarah Brune (Lanoka Harbor, NJ). Windy conditions at the course presented a challenge for rowers and led to a change in the regatta schedule. All races were compressed into two days, rather than three days. Also, the progression was changed so that the first round of races became more important. The top three finishers in the first round of heats qualified for the semifinal round to compete for places 1-12 in the nation. “All three of our boats handled the new progression well and qualified for the semifinal,” said PNRA/Mercer Director of Rowing, Justin Ochal. “The girls 8 really came together and put in three really solid races in the two days.” For the third consecutive year, the PNRA/Mercer girls 8 with coxswain boat competed in the grand final among the best six boats in the nation. For many rowers, the Youth National Championship Regatta is the last regatta of their high school careers. 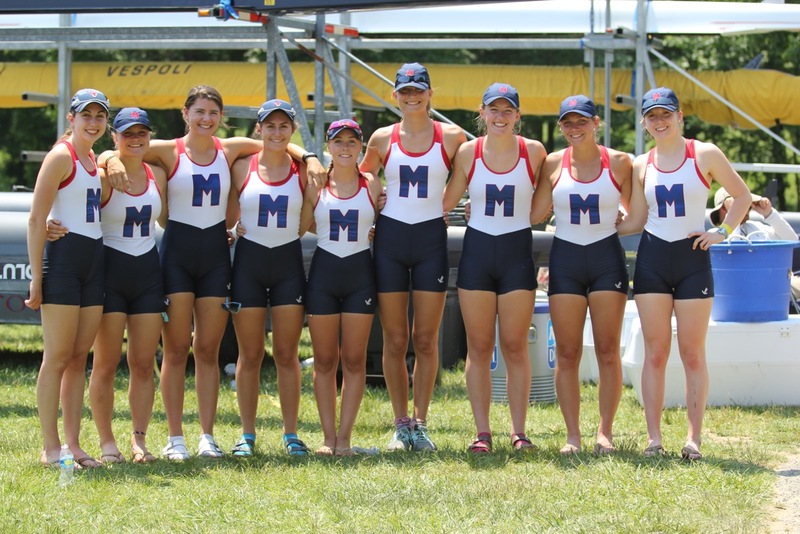 “It was truly a rewarding time to sit there on the line with top crews in the nation next to me,” said PNRA/Mercer senior Rachel Mumau, a member of PNRA/Mercer’s fourth-place girls 8 plus coxswain boat. “I was so proud to have been part of this boat at my last Youth Nationals,” she added contemplating the significance of the moment.